According to Scott Sumner, decreases of house prices are quite exceptional, which proves that the housing market is rational in the neo-classical sense, which proves that markets are rational in the neo-classical sense. Is he right? Or might the housing market be characterized by ‘house price illusion’, the idea that when one house sells for a higher price all houses will, eventually, sell for a higher price? And might there be a fallacy of composition: when one house gets more expensive, individual wealth of the owner increases. But when all houses get more expensive – this is just house price inflation and the total stock of real wealth does not increase a dime as we have to deflate this with the index of house prices? Anyway – the idea that house price decreases are the exception is just not right. Source: the new Eurostat house price data. Caveat: the data are not entirely comparable, Dutch house prices for instance decreased despite a decrease of the sales tax from 6% to 2% (while the same government at the same time increased house rents…). any data on the Italian market ? thanks ! Eurostat has Italian data only since 2010-I, the very latest data seem to indicate some decline. In the linked article, there is a fallacy in the way housing bubbles are evaluated. The author looks at a chart where 5 countries are shown with the house price indexes all starting from 1999. That is wrong. Nobody should claim the bubbles start at the same time. 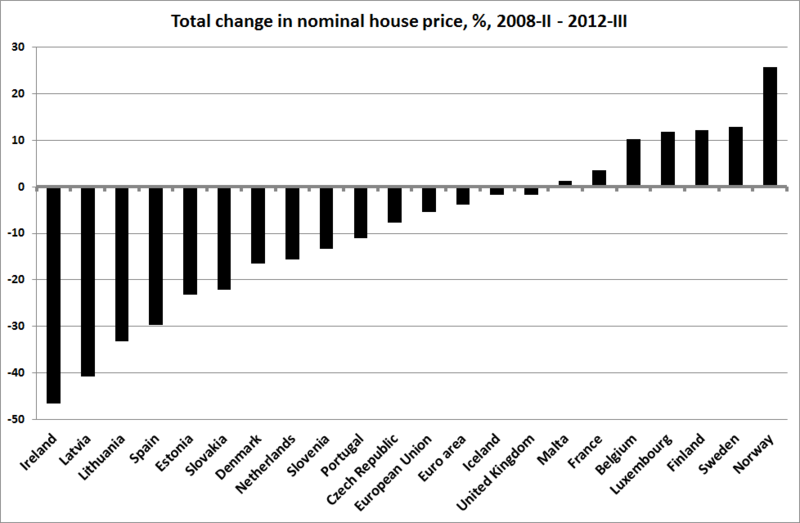 Look at the UK prices in this chart http://www.housepricecrash.co.uk/indices-nationwide-national-inflation.php. We shall see that, depending on the starting point of the analysis, up to today’s prices, the amount of decrease can point to nothing or a spectacular percentage fall. Looking at the UK prices, the building society’s single figures each year are presumably the average over a very wide range of houses in different localities and with buyers ranging from groups of indebted ex-students paying rental-level mortages to top 10% executives in the south-east buying lush homes in the south-east or profitable investments anywhere there’s money. As I see it the market has in fact bifurcated: still rising in the top end but falling markedly in deprived areas. In short, these estate agents’ fantasies, except insofar as they represent self-interest, are also virtually meaningless. Clearly the two worlds, the rich and highly liquid and the common income earner paying credits, experience divergent economies. But I don’t think this is a bad thing. The same Dubai was bankrupt 3 years ago, collapsing under its own fantasies and with its money sunk into the moist cement. The fiat money printed by central bankers actually save the illiquid big projects owners, many of them banks. The newly created money flow creates inflation for the stuff that is targeted to them. The common people still indebted for tens of years was not yet reached by that money flow. So inflation is moderate, if any. Just for a second, imagine a world wide agreement that all the debt of common people would be cut in half, like the Greek bonds. Or like TARP, the state takes away your credit for the next 10 years and pays the principal and the interest, while increasing the minimum wage. Imagine the madness hyperinflation occuring throughout the world.